Bennett: Likud will ultimately decide whether hareidi draft-dodgers are sent to jail, or receive economic sanctions instead. Minister of Economy Naftali Bennett, head of the Jewish Home party, said Sunday that he does not believe hareidi-religious men should go to jail for draft evasion. The Jewish Home party opposes criminal sanctions for hareidi draft-dodgers, while the Yesh Atid party led by Finance Minister Yair Lapid is in favor, he explained. However, he said, ultimately the Likud party will make the choice. “We’re waiting to hear the Likud’s stance, because they will decide,” he noted. Bennett struggled to explain why Yesh Atid supports criminal sanctions. “I don’t understand this desire to see criminal sanctions… I’m not sure, it could be the Supreme Court will say that criminal law must apply equally to everyone,” he said. 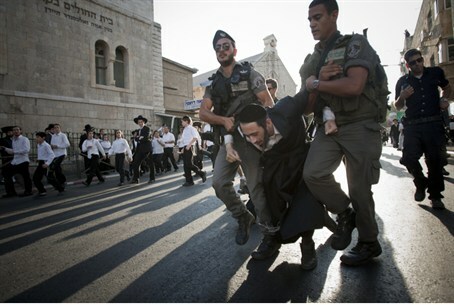 Draft dodging is normally a criminal offense; Israeli Arabs and hareidi-religious Jews are currently exempt from the law because they are not drafted. “If there is a way to avoid criminal sanctions, then I just don’t see the point,” Bennett said. Bennett noted that in his eyes, the primary goal is not hareidi enlistment in the IDF, but rather, hareidi participation in the workforce. “When 32 percent of first grade students are hareidi – which is fine – it’s clear that the Israeli economy won’t last long if a large number of them do not join the workforce,” he warned. “I think that in the long term, they should take part in army service, but it should be gradual. For me, it’s important that hareidi men be free to work, because otherwise the Israeli economy simply will not survive,” he continued. Hareidi-religious leaders have declared that Torah learning is of utmost importance – more so than enlistment in the military or seeking employment. While some hareidi-religious men choose to enlist in the IDF, the majority have traditionally deferred service in favor of full-time Torah study. However, the option of deferral was cancelled last year with the cancellation of the Tal Law, and the Knesset is currently working on a law that will require hareidi men to enlist.